California is fortunate to have ideal climate for growing citrus trees. Citrus do not require chill factor hours as many stone fruit bearing trees do. As evergreen trees the very green leaves fill in the dreary spots left by deciduous trees. Provide sunlight, space and water and add monthly feeding to produce a bounty of fruit. Dwarf citrus are ideal for containers near the kitchen where you can pluck a ready lemon or lime almost throughout the year. Fertilizer: Citrus grown on Flying Dragon rootstock are sensitive to highly alkaline soils (pH 7 and above). As long as the tree is fed regularly, such soils shouldn't be a problem. Use a fertilizer labeled for citrus; besides nitrogen, phosphorous, and potassium, it should contain the minor nutrients iron, manganese, and zinc. Follow package directions for application rate. If the foliage turns chlorotic (indicated by yellow leaves with green veins), spray it with a foliar food containing chelated iron and the minor nutrients listed above. Withhold fertilizer from fall through midwinter. Watering: Drip irrigation is the most reliable way to keep citrus watered, particularly if it's growing in a container. Run the system often enough to keep the soil moist but not soggy. (For plants in the ground, water when the soil is starting to dry out 5 to 6 inches below the surface; in containers, when it's starting to dry 1 to 2 inches down.) Whether you water by drip or by hose, water long enough to moisten the entire root area. 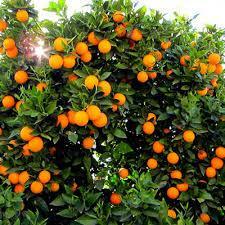 Consistent irrigation is key; fluctuating soil moisture can cause fruit splitting, especially of navel oranges. Frost protection: When frost is predicted, make sure trees are well watered ahead of time. Wrap the tree with a string of Christmas lights, then cover it with a frost blanket or floating row cover . Harvest: Most citrus fruits ripen from late fall into winter; exceptions are 'Valencia' orange, which ripens into spring and summer, and lemons and limes, which can bear year-round. Allow fruits to ripen on the tree. To determine whether sweet fruits like oranges are ready to harvest, pluck, slice, and taste one first. Pick lemons and other tart fruits before they become puffy.